Hello, everyone! 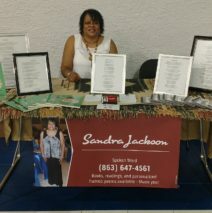 My name is Sandra Jackson, a local spoken word poet here in Lakeland. I’ve been writing since the age of 13–so for many years now. My poetry is of vast subject matter, from humorous to family to serious issues. I feel we should never be afraid to express ourselves in a positive manner as long as it’s coming from our hearts. I hope you stop by and see me!